We can drill 60mm Hardox 450 with our MasVR8 Drill. 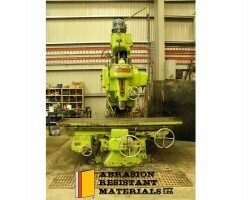 Our Large milling machine can machine 14 x meters of 500 HBN material – without needing to rotate the cutting tips. 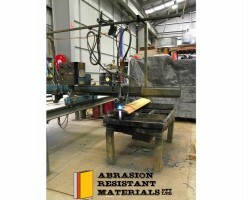 Our profile cutter – does an excellent job in making cutting edges of all different sizes. We contain and control costs – by doing most engineering jobs in-house. 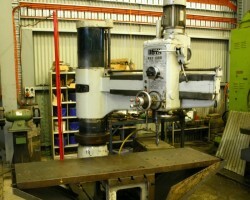 ARM MAS VR8 drill with no.6 morse taper - at the old factory .. ARM D10 edges made in-house .. ARM machine shop all back running after the flood of 2011 ..
Kendall and Gent vertical mill in ARM machine shop ..
Ooya drill with No.5 Morse taper in ARM machine shop .. 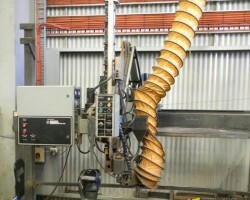 ARM profile cutter squaring holes in grader blades ..
New ARM welding machine all made in-house - commissioned 18 November 2009 .. ARM welders all back in operation after the 2011 flood .. The production line on one side of the new ARM factory ..
BHB 10 tonne crane given a complete overhaul and certified - all done in-house at ARM ..
Holes drilled and squared in the ARM engineering shop .. 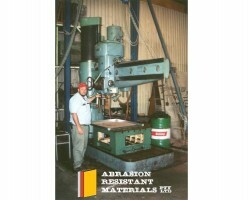 ARM drilled holes (55mm diameter) in 75mm thick Hardox 500 plate ..